Before our visit, students used visual thinking strategies to analyze portraits by Amy Sherald and Kehinde Wiley. Visual thinking strategies is a pedagogy that uses the questions, "What's going on in this picture? ", "What do you see in the picture that makes you say that?" and "What more can you find?" to allow students to collaboratively construct meaning from a piece of art. 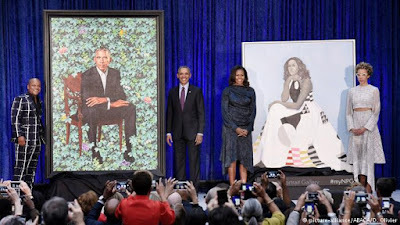 Natasha then showed the students the portraits of Michelle Obama and Barack Obama, which are owned by the Nasher and which we were able to see in person on our tour. Students were asked to determine which artist painted each portrait. Our field trip to the Nasher was so much fun! On arrival, our two lovely guides divided us up into two groups and we began our cultural journey through some beautiful works of art, namely the People and Portraits tour. Children were asked to contribute their thoughts and ideas about what they were seeing. The guides were impressed by their insights. Our hands-on activity was to create a portrait. We completed this activity back at school and will be displaying our work on the bulletin boards outside of River Class. Please come and take a look.